West Ham boss Manuel Pellegrini has said his Liverpool counterpart is used to winning games with offside goals. The Hammers held Liverpool to a 1-1 draw at the London Stadium last night, with Liverpool’s goal coming from an offside James Milner who assisted Sadio Mane. Pellegrini previously squared off with Jurgen Klopp in the 2013 Champions League quarter-final, when the managers were in charge of Malaga and Dortmund respectively. In the second leg, Klopp’s Dortmund scored a last-minute winner to qualify in which four of his players were offside. 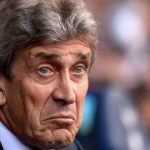 Pellegrini was left disappointed that his side could not get three points out of the game after a number of good chances and was frustrated at being denied victory by a refereeing error.